After reading Susan Crawford’s blog post about her new knitwear model, I decided that I should also model my own knitwear. I may look somewhat bleary-eyed, but that’s what happens when you need to help putting in the final touches of your partner’s Masters Dissertation (an oral history research about young women’s leisure, space and identity in 1960s Belfast, since you ask), at 1:30 in the morning. After having knitted a few jumpers using Elisabeth Zimmermann’s seamless construction methods, it was time to investigate another construction technique. This v-neck saddle-shoulder sweater has been knitted from the top down, following Barbara Walker’s ‘recipe.’ Her book Knitting from the Top is a knitting cult classic, for all the right reasons. In twelve chapters, Walker talks you through knitting all the garments you can think of, starting from the top. She relies on taking good measurements, and a generous swatch, so you can work out how to get just the right size. Most items are knitted seamlessly, so once you’ve cast off, all that’s left to do, is sewing in the yarn tails and block the item. The real eye-opener here is the shaped shoulder knitted in the round. Yes, this is actually possible! After taking all the necessary measurements and working out my gauge from my swatch, this jumper starts with knitting the shoulder straps for the saddle shoulders. Stitches are picked up from the long sides of the shoulder and then the back is knitted. I included short row shaping to make sloped shoulders. Once you have completed the armholes, you put all stitches on some waste yarn, and do the same for the front. 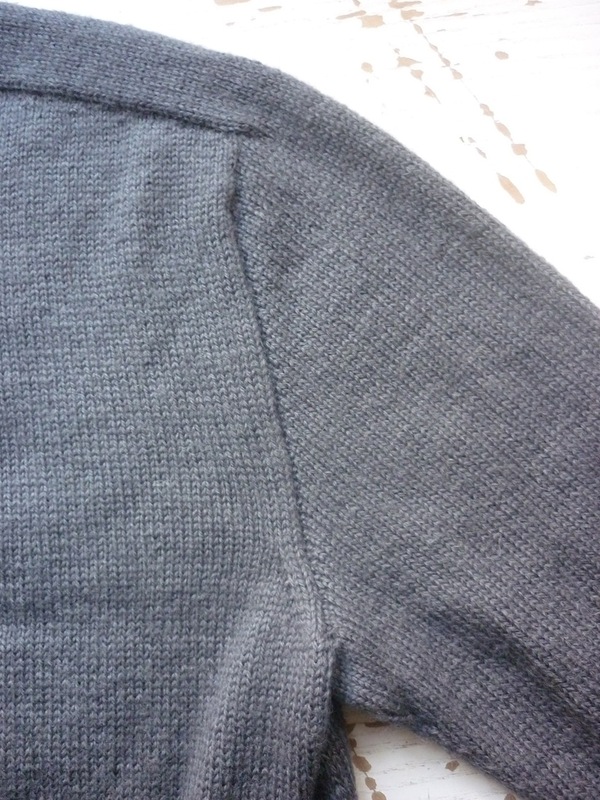 when the armholes are completed on the front, everything is put on one large circular needle, and one can continue knitting the body in the round. 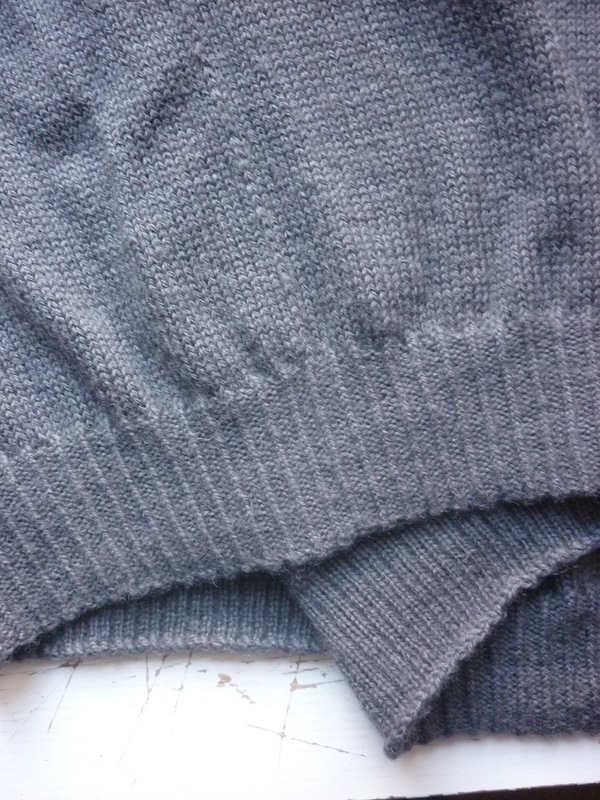 After this, stitches are picked up for the sleeves, and the sleeve cap is shaped with short rows too. Once these are completed, the sleeve is knitted in the round to the cuff. Walker also gives you directions to knit in the round all the way from the shoulders, and instead of picking up stitches, you create the armhole/sleeve seams by increases. Genious! All the welts have been knitted in a 2×1 rib, with the knit stitch knitted through the backloop. I like the graphic quality this gives, although I’m not sure if I would use this again, as I find that at the cuffs and the hem tend to curl up a bit. Perhaps next time I either do a 1×1 rib, or a 2×2 rib, so that the amounts of knits and purls are completely balanced. The cast-off looks so neat and sharply cornered, because on the cast-off row, I also did a centred double decrease at the corner, before taking the previous stitch over the new stitch and off the needle. For the side seams I employed Elisabeth Zimmermann’s ‘phoney seam’. Before starting the ribbing, I dropped down the seam stitch all the way to the armpit, and hooked it back up with a crochet hook, alternating picking up one, and two strands. I mainly used this as it makes blocking much easier, as this way I don’t have to guess where the side seams would be. You can see the phoney seam as one column of slightly larger stitches. There are a few niggles in this jumper that I’m happy to live with, but which I want to avoid in the future. These mainly concern the shoulders and armholes. I think I could have made the shoulder saddles a little bit shorter, and the armholes a little bit deeper.I think this will make the sweater sit better on my shoulders. I already mentioned my doubts about the pattern I used for ribbing. The sweater could’ve been little bit longer, and lastly, the sleeves could be a little bit wider. 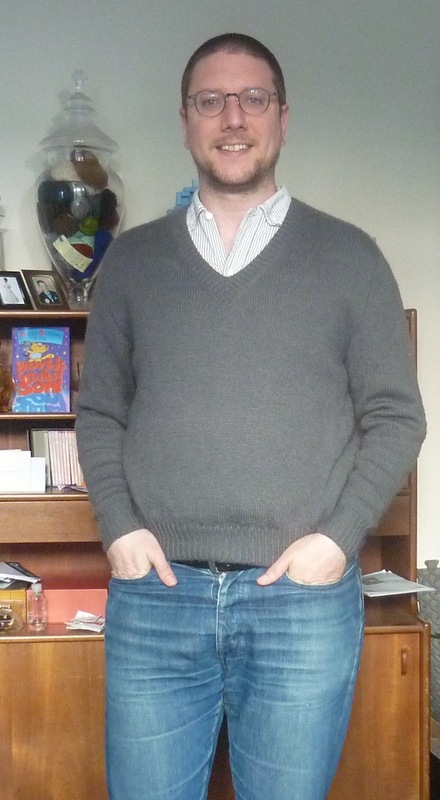 Evenso, I’m really pleased with this jumper; it’s a great addition to my wardrobe. 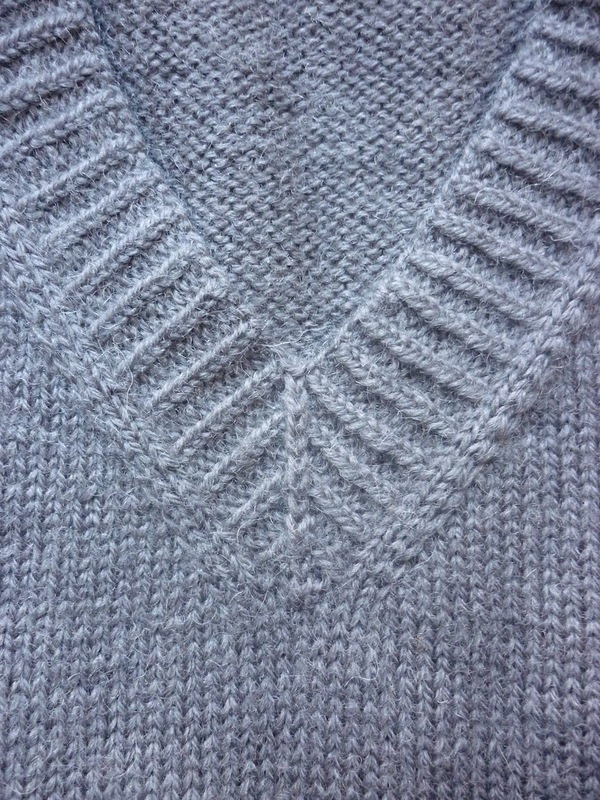 My v-neck jumper was knitted in Excelana 4ply, in the Persian Grey colourway. Excelana is Susan Crawford’s range of knitting yarn, especially developed to recreate the look and feel of vintage yarns, which complements her vintage style patterns. I still have a couple of balls left, so don’t be surprised if I make a hat to match! Have you ever knitted a garment from the top down? What did and didn’t you like about this approach? congratulations to your great jumper. I like best about top down that it fits perfect. One can try it on while knitting ..
What beautiful work, Tom! I am awestruck! I have done 2 top downs and I like the method a lot – though in both cases the sleeves have ended up a bit tight, so I will need to watch that in future. I also find the final stages a bit wearing – when you are manipulating an entire garment with a mind of its own on your lap (of course that’s the same with bottom up knit-in-the-round-no-seams). Love your sweater, Tom, esp the very elegant V-neck. I love your grey knit, more so given all the little polishing details thet went into its making. I knit top down exclusively, and also enjoy working on little details. Thanks for the post detail, btw I do find EZ and BW have a fit that is not so contemporary in the shoulder and sleeve, so I do modify then a little as you are planning to do. Each top down design is a learning curve, but the advantages of seeing the garment as you work and trying it on are so worth having the entire garment on the needles. I love the jumper, well done! I have never done a top down – it is on my ‘to be explored’ list. I think the V-neck is really wonderful. Very nicely shaped and finished. I love Elizabeth Zimmermann’s work, her seamless jumpers fit amazingly and have that classic look. I will get the Barbara Walker book you mentioned. All 4 pattern books are part of my most treasured possessions. Wow, that looks amazing. I especially love the V-neck close-up detail. Its nice to see what the phony seam looks like. I’ve read about it from EZ’s books but was curious about how it looks. I might have to try it. I too am hooked on Barbara Walker’s Knitting from the Top. Top-down is much more fun for me I think. Although only knitters will appreciate the actual work, I hope that non-knitters with an eye for detail will still appreciate it’s nicely finished. the closeup shot of the v-neck point is gorgeous. and thank you for the uplifting link to susan crawford’s post. That’s a totally gorgeous jumper Tom! The jumper is fantastic Tom, congratulations on such good work. I’d afree with you that it could be longer on you, for comfort’s sake, and that I’d also make the sleeves wider, also for ease of movement. I’m working on a saddle shoulder zip-up cardi for my husband just now, and am designing it as I go along (I did a rough ‘proto’ design to be adjusted in the reality of its knitting. I’ve still to pluck up courage for a neck down circular needle trial, but shall get there eventually. 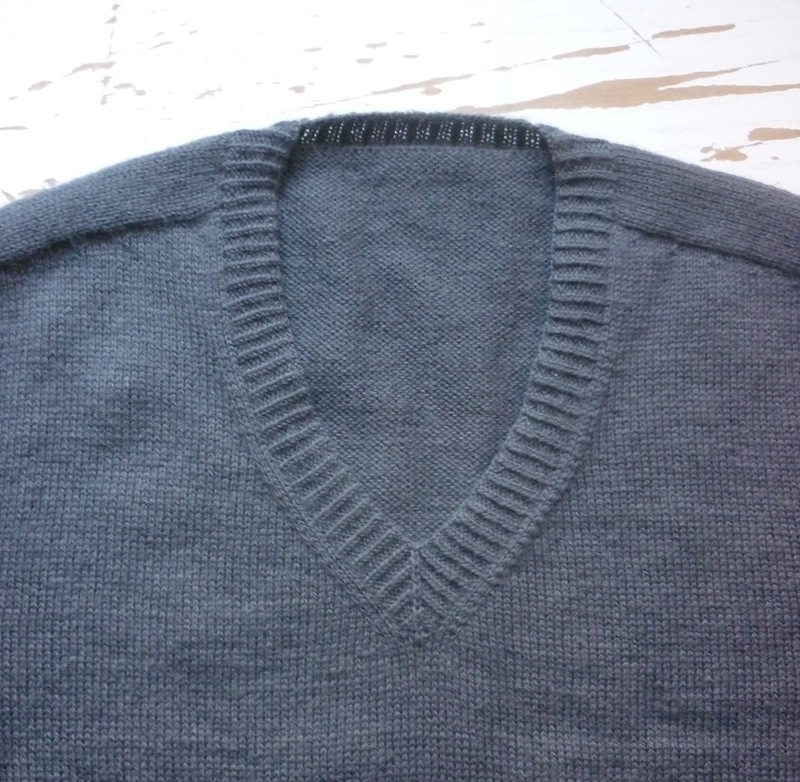 My mother and grandmother would always do the v-neck shaping at the centre in the same manner (school jumpers for me and my sister). It sits more nicely when the V is sharply angled. I am attempting my first v neck sweater and can’t find simple instructions on creating a perfect v. This one is perfect. Can I ask for simple instructions on creating this v please. I have all the instructions to pick up including no of stiches. Have only started with joining two left shoulder seams. Just make sure that a knit stitch is right at the bottom of the V and then use a centred double decrease every other row at that same spot.